Not valid with any other discount. Most vehicles. Price includes shop fees ...more info and details. Everything in our regular Oil Change (Includes up to 5 quarts of 5W30 Oil and a new Oil Filter (high-end and special canister filters extra)) Plus A complete Engine Flush. * Includes oil & filer change & tire rotation. 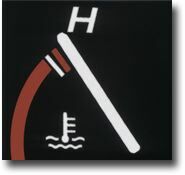 Inspect & fill fluids, inspect tires, brakes, exhaust, front-end, suspension, belts, hose, wiper blades and CV boots. Most cars, light trucks and vans. Other grades and synthetics available at extra cost. Diesel vehicles extra, custom wheels and oversize tire rotation extra. Most vehicles. Not valid with any other discount. Valid at any Midas Hawaii location excluding Maui, Kahului. 6 cyl., 8 cyl., and special fluids are extra. additional charges. Gasket & filter extra. Flush and system conditioner additional. ** Prices reflect price for most cars. 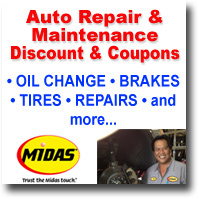 Valid at any Midas Hawaii location excluding Maui, Kahului. Please review special online auto terms and conditions on right menu. >> ...more info and details. 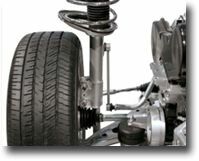 Our Power Steering Service will improve performance, eliminate noise & stiffness and extend component life. The service will remove old fluid and replace with new Dextron III power steering fluid. Your manufacturer's recommended fluid may require additional costs. Not valid with any other discount. Most vehicles. Valid at any Midas Hawaii location excluding Maui, Kahului. ** Includes Caster, Camber and Toe adjustment for most cars and light trucks. 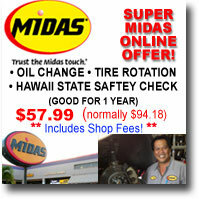 If you have a PayPal account click on the PayPal verified icon to verify Midas Hawaii Auto Repair & Service with PayPal. If you have a PayPal account click on the icon above to verify Midas Hawaii with PayPal. Prices below reflect price for most cars. Actual price/cost for your car may be higher if service requirements/specification are different than standard cars and/or additional needs are required. Email us if you think your car requirements do not fit standard cards. If your service/repair does cost more, your discount purchase will be applied to the total bill with a 5% discount on additional costs. Certificate can be redeemed at any Midas Location for up to 1 year. Save $$$ - Buy Online - Includes up to 5 quarts of 5W30 Oil and a new Oil Filter, a free tire rotation and visual brake inspection. Save $$$ - Buy Online - Includes 3 oil changes, each oil change includes tire rotation, 1 Four Wheel Balance & 10% Off Any Job over $100. 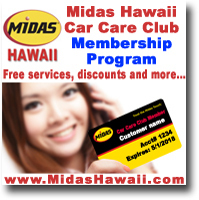 Save $$$ - Buy Online - Certificate may be used to purchase $50 or $100 worth of products or services performed at any Midas Hawaii location.